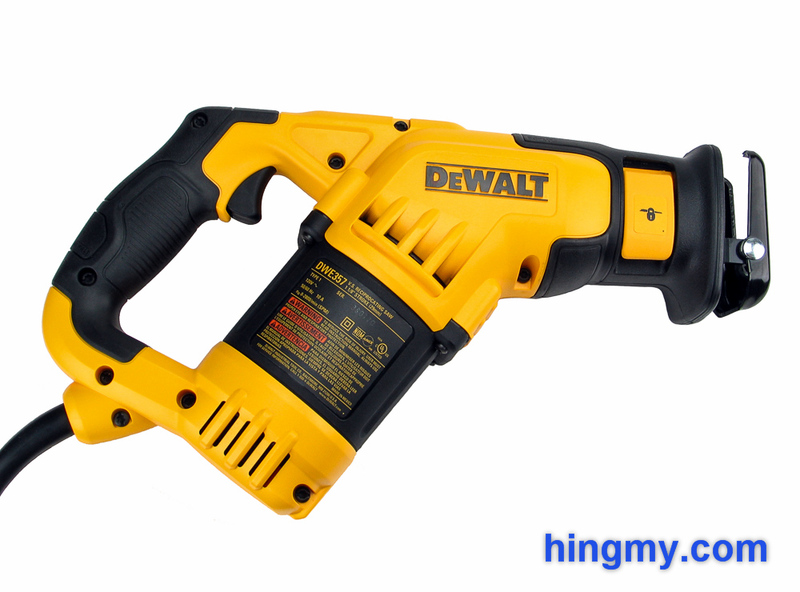 DeWalt recently released a new compact reciprocating saw. The DWE357 takes the established reciprocating saw design and shrinks it down to 14.5" of length. With the motor installed at an angle this saw can go where few other saws can. Let's take a look at what the DWE357 can do and if it is a better reciprocating saw. DeWalt created the DWE357 to fill a niche in the reciprocating saw market. Sometimes you need to make a single cut, but do not want to set up your full size reciprocating saw for the job. The DWE357 is a compact reciprocating saw that is easier to transport than a full size saw, yet offers comparable power and cutting performance. 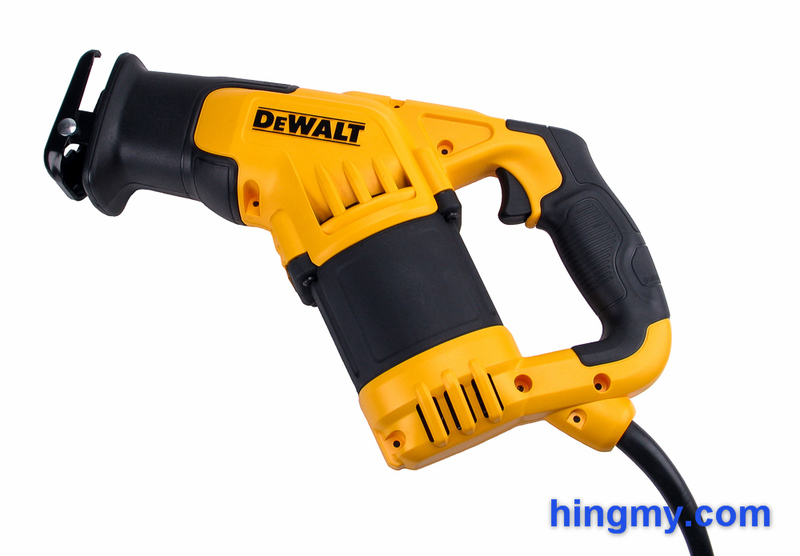 Like all DeWalt reciprocating saws the DWE357 is well built. When you pick up the tool for the first time you'll immediately get a sense that you are holding a commercial quality tool. 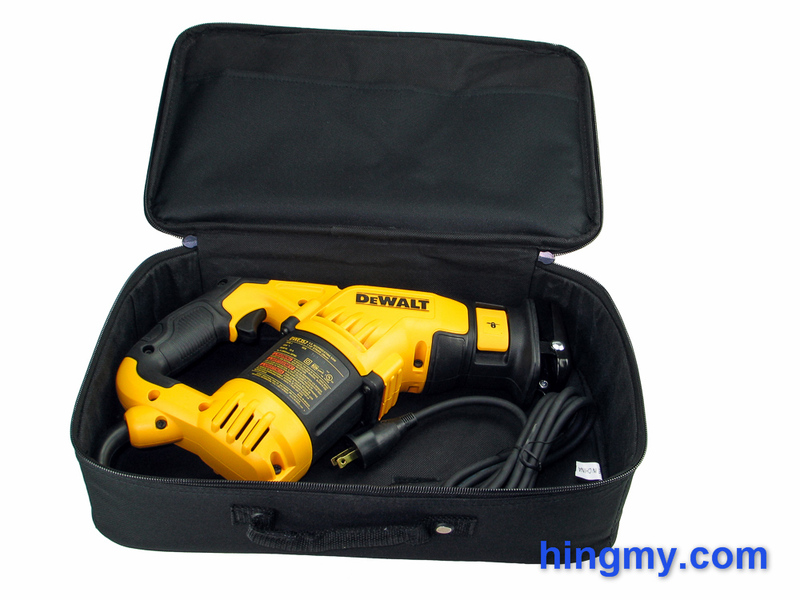 The DWE357's motor and all-metal gear housing give the tool a considerable amount of weight. The excellent fore grip combined with the D-handle in the back make for an aggressive, yet controlled cutting stance. One could not ask for better ergonomics. In many respects the DWE357 is more comfortable to hold than a full-size saw. Fine cuts are easier to perform. The balance of the tool is neutral with most of the weight concentrated in the motor area right between the user's two hands. This dynamic causes the saw to cut slower than traditional saws, which depend on a heavy head to push the saw down during a cut. On the flip side, this setup makes the DWE357 more controllable when working overhead, or even one-handed. The blade holder is better engineered than most. A large yellow lever releases and ejects the blade. A spring returns the lever to the locked position. The fit of the blade is secure, but in DeWalt tradition somewhat lose. Other brands do better here, but a lose fit is not really a problem for most tasks. The blade can be installed in four different directions allowing the saw to cut up, down, left, or right. The boot of the saw has very little flex to it. Looking at the hinge one would assume that the boot bends quite far in both directions. In reality it has a range of about 20 degrees. That's too little to "follow the contours" of the work piece. In practice it is rounded edges of the boot that guide the saw. Cutting in all directions feels natural and controlled, but there are better boot designs out there. The tool comes in a cloth 'case'. While most cloth storage solutions have serious issues, this version is better than most. The bag is made of strong nylon and takes the form of an actual case. With the saw inside the case lies flat, but stacking other cases on top of it is out of the question. What value you attach to this solution is up to you. For us it does little more than keep the cord out of the way. Any blades you leave inside are free to bump into the tool. Their teeth will attack the nylon walls of the case. The bag may be enough to store the tool in your garage, but on the jobsite we expect better. This is where the story of the DWE357 develops a sour note. This great looking, well built saw has a serious flaw when cutting; it vibrates way too much. So much so that your hands will hurt after using the saw for 10 minutes. When run in free air the saw will make your wrists hurt in 30 seconds. There are no active or passive vibration dampening mechanisms to speak of. This saw simply cannot be used for all day work. It will take you out for the rest of the week should you try. That's really a shame, because the saw does cut very well. The powerful motor does its best to power the blade through the cut. Even heavy cuts through cast iron did not stop the DWE357. Cutting speed is just above average. The generous stroke and fast top speed do their best to push the saw through the cut, but the limited amount of weight in the head of the tool keep the saw from challenging for the performance lead. Overall, however, the saw's power and speed matches its intended application range. The best trick the DWE357 can perform is cutting at extremely low speed (60 strokes per minute or less). The excellent variable speed trigger makes it easy to select and hold a specific blade speed. Starting cuts slowly, which is often necessary when installing pipes, is very easy to do with this saw. Plumbers and carpenters might find a good tool in the DWE357. It's much easier to handle than that full-size saw you may be carrying around. This saw will reach deeper into joist bays than just about any other saw. For overhead work the DWE357 is a star. For home use this saw may be a good option. It can do everything you ask of it. The cord aside, the DWE357 is a good pruning saw. Its low weight makes it manageable for users who do not have the strength to be construction workers. Those few times you need the saw for a project, you'll have to deal with the punishment it deals out. The DWE357 is a frustrating package that could have been so much more, but fails so spectacularly. The excellent build quality cannot compensate for the vibrations this saw sends into the hands of the user when cutting. If you try to make more than a few cuts at a time, this saw will hurt you. Those few cuts, however, the DWE357 will complete as well as any saw. This brings up the inevitable comparison with cordless reciprocating saws. The DWE357's advantage over these competitors is power. Since the saw can only bring this power to bare in a limited number of cuts, the mobility of cordless reciprocating saws begins to look more attractive. The DWE357 is a very odd package that is only a good choice in a very narrow range of applications. Make sure you understand what this tool can do for you before you buy it.